Support Teacher on the Star Dance Tour! Sunday Update: Kris and Briana won the popular vote! Thank you to everyone who voted for them! I wanted to take a few moments to ask all of you who have supported me and this blog to extend that support to my teacher Kris Suakjian and his professional partner Briana Haft at the Twin Cities Open tonight! They are participating in the Star Dance Tour. It’s a tour for professional Smooth and Latin dancers. The couples accumulate points based on their results at the various competitions, leading to a final showdown at the City Lights Open in January 2017. Teacher and his partner are competing in the Pro Open Smooth event as well as performing a show dance solo routine. It’s kind of like Dancing with the Stars because there is an audience vote that counts for points too! This is where I’m asking for your help. You can watch the Twin Cities Open via free live streaming on the Star Dance Tour’s webpage. The pro smooth event starts tonight about 745pm PST. The show dances will happen right after. After all of the show dances are done, the polls open for only 5 or 10 minutes! Watching on your computer or tablet or phone, all you have to do is refresh the page when the MC announces that it’s time to vote. A list of the couples’ names will appear below the streaming video and all you have to do is click their names: Kris Suakjian and Briana Haft. You can also look for their number: 102. If you have multiple devices, vote on all of them! Note that there may also be a “wildcard” vote after the semifinal round of Pro Open Smooth. This is to give a couple who didn’t make the final still have the chance to perform their show dance. You can vote for someone here too, but be sure you hang around until after the show dances to vote for Kris and Briana! Another way you can vote is via text! Text “dancebeat” to 22333. You’ll get a response back acknowledging that you’ve joined the session. Then when it’s time to vote, just text “102” to the same number. You will get a response back, something like “You chose 102 Kris and Briana.” And that’s it! As people vote, you’ll be able to refresh the live streaming page for updates on who’s winning the audience poll. That’s all there is to it! 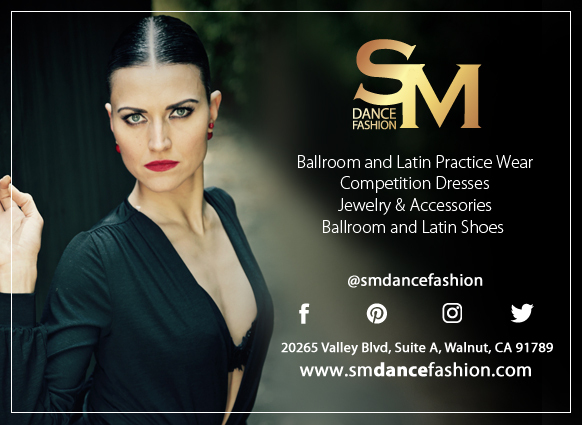 Just a little bit of your time, which you get to spend watching AMAZING ballroom professionals do their thing! The show dance solo routines are especially fun to watch. I’ll be on Facebook and Twitter posting updates and when it’s time to vote, so stop by and say hi if you’re on! Please watch tonight and VOTE for Kris Suakjian and Briana Haft! Many thanks, and happy dancing!